In frames taken from a video posted on Twitter by Alexis Hewitt, a Wildwood police officer is seen throwing a punch at the head of a Philadelphia woman on the beach. 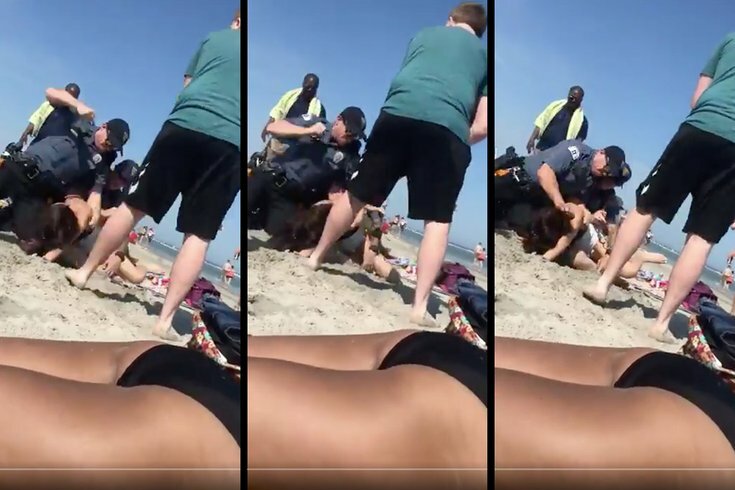 The Philadelphia woman whose arrest on the Wildwood beach last summer turned violent has pleaded not guilty to multiple charges stemming from the viral Memorial Day weekend incident caught on video. Emily Weinman, 20, of Kensington, entered a not guilty plea Friday morning in a Cape May County Court, according to CBS3. Weinman's arrest initially sparked shock and outrage when bystanders uploaded videos of a police officer striking the young woman on the head multiple times. Body camera footage later released by Wildwood police revealed the arrest stemmed from Weinman's refusal to comply with officers' requests to provide her full name. Weinman, who was suspected of underage drinking, passed a breathalyzer test and explained to officers that the alcohol in her cooler belonged to her aunt. During the dramatic arrest, one of the officers is heard saying, "Alright, you're going to get dropped." Police claimed Weinman struck one of the officers before they attempted to arrest her. They later said that she spit at one of them. Both officers were cleared of wrongdoing in the incident after a review by Cape May County prosecutors. In September, Weinman was indicted on charges of aggravated assault, resisting arrest and related offenses. She had turned down an earlier plea deal. Weinman's next court date is scheduled for Jan. 25.